This newsletter covers the work on the Jefferson Jyrodyne prototype and 1/10th scale drone from the end of October until the end of December, 2016. While short, this one describes a major milestone – the rollout of the basic structure of the full sized Jefferson Jyrodyne on its landing gear. 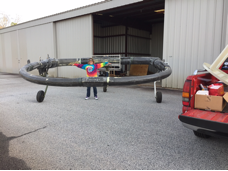 The big news is the transfer of the jyrodyne 14’ diameter ringspar mounted on its landing gear and parts to a single hangar in December, 2016. 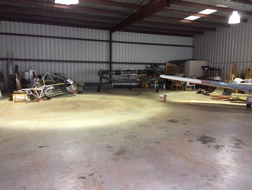 Prior to the move, one “T’ hangar was being used for storage of parts, and home for our Piper TurboDakota aircraft. Another was being used as the hangar for the RANS S6 I own with three other partners, and the third, larger hangar was where assembly of the ringspar and attachment of the landing gear and the passenger compartment was taking place over the past few months. This is a partial shot of the new 60’ x 60’ hangar for the TurboDakota(wing seen on right) with the ringspar on its gear in the center background after the move, and the pile of parts to be installed on the left. Work on these has been delayed due to the move. Work progresses on the next patents on the Jyrodyne, to include the items specifically not mentioned in this newsletter to avoid “public” announcement of the invention. There have been a large number of improvements since the first patent issued in 2005.